Formulated without soap and enriched with soothing white clay, Cattier Organic Soap with Mint & Pomegranate produces a soft and creamy foam that gently cleanses and respects the skin’s natural pH. With its surprising fresh and slightly sweet fragrance, Cattier Cleansing Gel for Hands works like a charm, inviting you on a journey through the Middle East ! 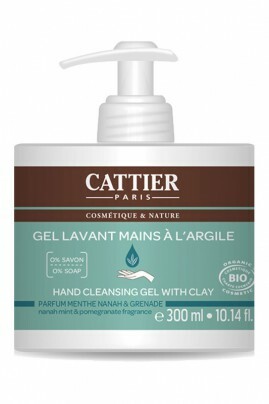 Cattier Organic Hand Cleansing Gel Mint and Pomegranate smells so good !